Two cut out sterling silver hearts creates this dainty butterfly ring that can be worn alone or stacked with your favorite Mommy Stackers! The band can be stamped with up to 18 spaces per side with your choice of name, date or short phrase. It showcases a 3mm round birthstone of your choice from the list below bezel set in sterling silver. The pricing for the precious stones are for lab created stones, please contact me if you'd like a quote for a genuine precious stone. Photo of the ring on is an example of what the butterfly ring would look like stacked with a 3mm round and a 4mm round Mommy Stacker. The butterfly itself measures approximately 1/2" wide and the wings are curved upward. 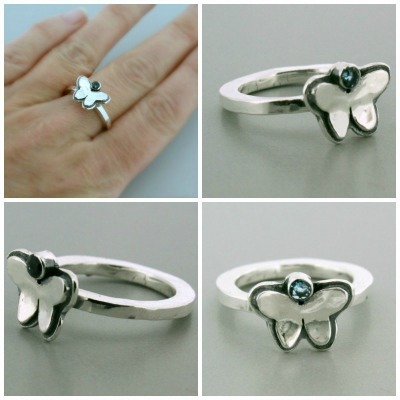 The purchase of this listing includes ONE custom sterling silver stacking ring with a small butterfly and a 3mm round bezel set gemstone of your choosing. 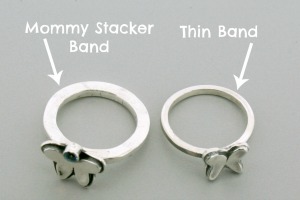 Unsure if you'd like a Mommy Stacker or a thin band ring? Here's a side by side to help with your decision.